An estate version of the fastest car we've currently got on the Parkers fleet, the SEAT Leon Cupra, is coming to the UK this year. 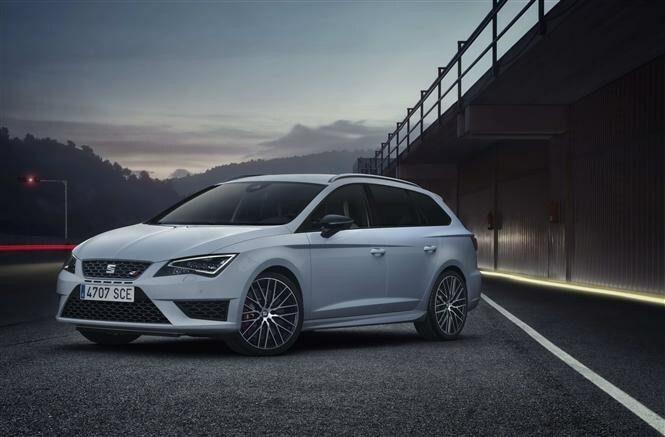 The SEAT Leon ST Cupra 280 will be launched in March 2015 and will feature a 2-litre TSI engine like its hatchback counterpart. The manual will cost £28,505 with a DSG automatic starting at £29,860. Boasting 276bhp, Dynamic Chassis Control and mechanical differential lock, an automatic Leon ST Cupra 280 will shift its 1,470-litre loadspace from 0-62mph in just six seconds, says SEAT, just 0.2 seconds slower than the five door in straight line. It’s good news in the corners too, as SEAT says it had spent time poring over the finer details of the estate model to ensure it has the same ride and 'athleticism' as the hatchback. This is the first high-performance estate SEAT has made and will be available with a choice of six-speed gearboxes - automatic DSG or manual. With a broad spread of torque from 1,700rpm to 5,600rpm, the Leon ST Cupra should have no problems pulling away, even when that big loadspace is full. SEAT says the DSG-equipped model will return a fuel economy of 42.8mpg, and CO2 emissions of 154g/km, while the manual offers 42.2mpg and CO2 figures of 157g/km. Every Leon ST Cupra has full-LED headlamps and the LED rear lights, alcantara sports seats, Cupra steering wheel and Media System Plus with 5.8-inch colour touchscreen. Inside, ambient lighting is controlled by LEDs in the door panels to emphasise the contours of the interior. They also change from white to red while in Cupra or Sport modes. Black leather upholstery with white stitching is available, and for body-hugging grip there are optional bucket seats. The Sub8 Performance Pack first seen on the hatchback is also available on the estate. This gets you larger Brembo brake callipers, unique 19-inch multi-spoke alloy wheels in black or orange, and body-coloured side skirts for £2,025. Semi-slick Michelin Pilot Sport Cup 2 tyres can be added for £460. To help your Leon ST Cupra stand out from the rest you can also select optional White Line, Black Line and Orange Line styling packs. These add colour to the radiator grille and door mirrors surrounds, and parts of the two-tone aluminium wheels. Comfort, Sport or full-fat Cupra? 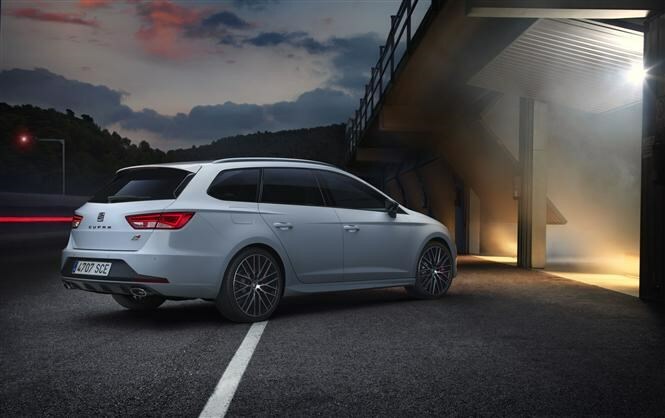 For times when you want to dial down the Leon ST Cupra’s raw performance, if you’re transporting an antique grandfather clock, for example, the drive profile system can be used to adjust the car’s performance parameters. The softest Comfort mode is tightened up by selecting Sport setting, while in Cupra mode the throttle response is at its most sensitive, the DSG in its sportiest shifting mode and the exhaust at its loudest. It benefits from a new generation of Dynamic Chassis Control, which can adapt the chassis in a matter of milliseconds. The front-axle differential lock seen in the hatchback is also carried over to improve the traction and handling of the front-wheel-drive Leon ST Cupra. With a maximum locking force of 1,600Nm, the diff' not only improves traction, but eliminates the tugging you experience from the steering wheel on powerful front-wheel drive cars known as torque-steer. 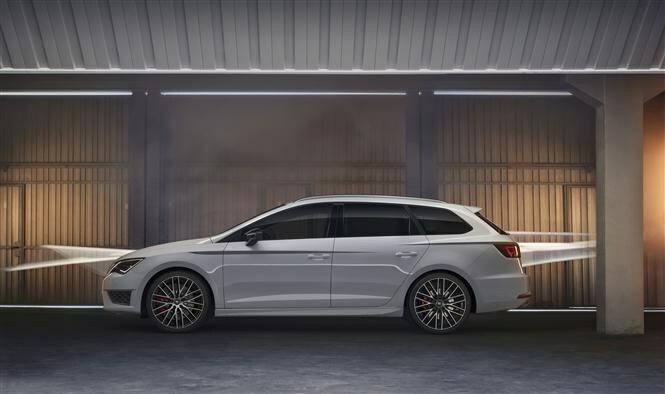 Pricing for the ST Cupra will be released before the car is launched in March. We'll be among the first in the world to drive this hot new estate, so keep an eye out for the full SEAT Leon Cupra ST review coming soon.